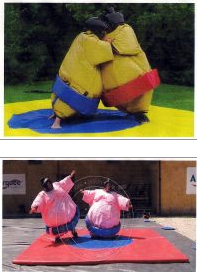 We have recently added both Adult and Child's sumo suits to hire stock. The suits come complete with 15ft x 15ft sumo mat and protective head gear. They are sure to be a hit for any occasion. So, for your kids parties in Glasgow, Bounce Around are your ideal choice for both castle hire and garden games in Glasgow. Call us on the number above or contact us through the form on our 'Contact Us' page. Go on, have a bounce!